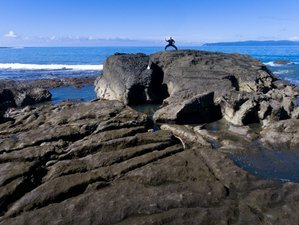 Learn the original Chen style Tai Chi system in a pristine, tropical oceanfront setting, to reduce stress, reverse the aging process, cultivate vibrant health and wellbeing, and develop practical self defense skills. During your Tai Chi Vacation/Retreat you will be accommodated at Cabinas Las Gemelas. It is located just minutes walk away from beaches, supermarkets, and restaurants. With ocean, mountain, and awe-inspiring sunset views daily. You will wake up to the sounds of pounding surf and a symphony of birds and monkeys. Each room at Cabinas Las Gemelas accommodates up to four guests. One week Tai Chi Retreat includes one or two 90 minute tai chi class daily. This is our standard one week package. We have several local restaurants to choose from, all within a few minutes walk of your lodging place at Cabinas Las Gemelas. There are three supermarkets all within a few minutes walk from your lodging place at Cabinas Las Gemelas. To reach Pavones, you can fly to Golfito Airport (GLF) with Sansa Airlines, and from there, take a taxi to Cabinas Las Gemelas (taxi is generally 70 USD). You can take the bus (Tracopa Bus) from San Jose to Paso Canoas and from there catch a taxi to Cabinas Las Gemelas in Pavones. Our 6 day/ 7 night retreats always begin on Sunday PM and checkout is on the following Sunday at 12 noon. Each week we accept a maximum of 8 students. This is to maintain a more personal one on one teaching setting and the highest quality of instruction. One 90 minute tai chi class per day; Shared lodging up to 4 people. Price is per person. Two 90 minute tai chi classes per day; Shared lodging up to 4 people. Price is per person.